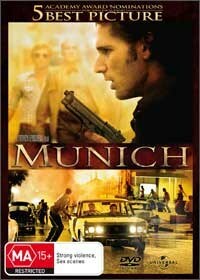 Munich is director Stephen Spielberg's re-telling of the 1972 terrorist event about 11 Israel athletes that were murdered at the Munich Olympics. This interpretation briefly begins at this pivotal event which then leads into the unofficial campaign by the Israel government to wipe out all members of the plot who were involved in this political terrorist act. The story itself centres on Avner (Eric Bana), whose wife (Ayelet Zurer) is pregnant and Bana's character is having difficulty juggling between his normal life in society and the world of underground espionage who brings humanity to this picture, even though his Australian accent sometimes breaks through. Munich is suspenseful and well crafted that emphasis on the world of night, thanks to Janusz Kaminsky who uses realistically gritty city locations to emphasizes the message of this movie. There is nothing exotic or glamorous about these special agents, just men drawn together by their country to perform a specific task. What makes Munich so compelling is the story behind the events and how these men eventually begin to question whether what they’re doing is just or a means of strengthening their government by acting as their unofficial assassins. The ending of the movie highlights the difference between the two main characters as one who has retained his human spirit, whereas the other as a tool for his government... gripping stuff!